Irish Baby Blessing: Express Their Irish Sides from a Very Early Age! 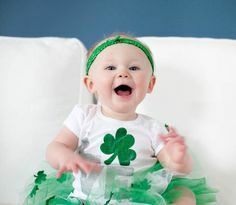 Irish Baby Blessings: Express Your Irish Side (and Theirs) at a Very Early Age! Blessings play a key role in Irish culture, and Irish baby blessings are a cherished Irish tradition. We use them at birthdays, baby showers, christenings … anywhere we wish to honor and protect a child or their parents. As with all Irish sayings, baby blessings range from funny to wise to just plain tear-jerkers. There are hundreds of blessings to choose from, and each has its own special meaning to the speaker, listener or reader. If you would like to know more about Irish blessings in general, you can visit our main section on that topic here. In the meantime, here are some of our favorite Irish baby blessings! If you are like us, you prefer your blessings short, sweet and easy to remember. If they also rhyme, that’s a bonus! Have a look at these favorite Irish baby blessings, as chosen by our most frequent visitors. Irish blessings are an essential part of Irish culture and heritage. Share them during special occasions, to celebrate Irish culture and express your personal Irish side!